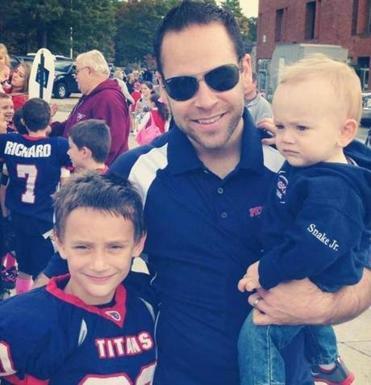 Mike Cogburn and his sons Jacob, 10, and Mason, 2. Cogburn is a local athletic coach and spearheaded development of the Pembroke coalition. Late last year, Mike Cogburn became alarmed by the spate of reports of people around the region overdosing on heroin and other opiates. “It scared me,” said Cogburn, a father of two boys in Pembroke and an active local youth athletic coach. He was further troubled to find that his hometown did not appear to be doing much to keep young people safe from the scourge of drugs. “Other parents called to my attention that the schools didn’t have formalized health classes” where drug prevention could be taught, said Cogburn, who also learned that the town had long ago discontinued having a police officer involved in drug education. His findings spurred him to propose a new community initiative to combat drug abuse, an effort that culminated in the recent appointment by the Board of Selectmen of the Pembroke Drug Prevention Coalition, and the formation of a support group to the coalition, the Pembroke Titans Against Drugs. The coalition’s initial focus is on raising money to expand educational programs in the schools and elsewhere in the community to help teach young people to stay away from drugs and to make other healthy choices. Selectman Arthur Boyle, a coalition member, said he was prompted to participate in the effort because of concern for the number of young people getting involved with drugs. The town had a prior substance abuse group that disbanded about five years ago when its grant expired. But Cogburn said there has not been much community discussion of the issue in recent years, so response to the new group has been encouraging. The coalition has about 20 members, and as many as 80 people overall came to one or both of its first two meetings. “It’s a community-wide effort,” he said, noting that participants at the meeting have included everyone from a police officer to school parents, teachers, and people who have been directly affected by substance abuse. Patrick at that time ordered that the overdose reversal drug Narcan – the brand name for naloxone – be made easily available to first responders and others, among a number of steps to stem the crisis. In August, Patrick signed into law a comprehensive bill to curb opiate overdoses. There were 18 fatal overdoses involving opiates in Pembroke in 2000 through 2012, nine of them in 2010-2012, according to state data. Fire Chief Jim Neenan, whose department has been carrying Narcan on its ambulances since 1999, said incidences of overdoses have tended to be cyclical in recent years. Like many communities, he said Pembroke experienced a spike of overdoses earlier this year, including on a single day this spring when there were three. The numbers have since subsided, but “the problem isn’t going away,” Neenan said. Both Neenan and Police Chief Richard D. Wall, whose department is preparing to equip its cruisers with Narcan, said they welcome the new coalition. The school district previously employed a health teacher at the middle school, but eliminated the position due to budget cuts several years ago, according to School Superintendent Frank Hackett. Since then, the school has offered a 21st Century Skills program that covers some health issues, including drug and alcohol abuse. At the high school, there is no health teacher, but health topics, including drug and alcohol abuse, come up in science and wellness classes, guidance seminars, and advisory periods. The district also offers periodic speakers on the subject. “We would love to be offering more substance-abuse prevention for our students,” Hackett said. But he said the district is hampered by a lack of resources. Due to budget constraints, the district had to cut 15 positions this fiscal year and as many as 30 overall the past two or three years, according to Hackett, who noted that Pembroke has the ninth-lowest per-pupil spending rate among districts in the state. Hackett said the district is thrilled at the new effort in town to grapple with the substance-abuse issue. “We are a pretty close-knit community, and it’s really good to see people coming together on this obviously critically important topic,” he said. Allison Kelly, a coalition member, said she was motivated to join the group by the fatal drug overdoses of a number of young people she knew from the area in recent years, notably a close friend and fellow member of the Pembroke class of 2007. In addition to educating children, she said, there is a need to make the community more aware.